“The vote taken today is historic and celebrated by working families across the state. Testimonies of support from legislators demonstrated a sense for the hardship that such low wages are causing for 1.4 million workers in Illinois. We applaud Majority Leader Lightford for leading the way and the legislators who took this bold step. 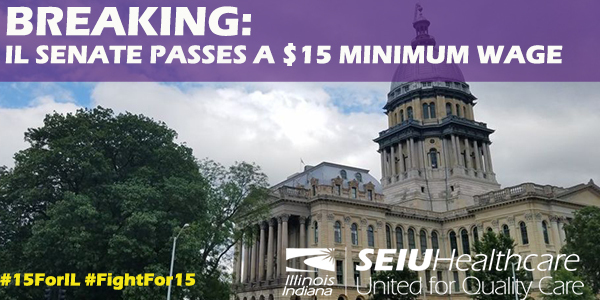 “We are especially appreciative that lawmakers recognized the importance of lifting the minimum wage to $15 for ALL of Illinois. Tens of thousands of the workers we represent live outside of a large city and are in desperate need of a $15 wage floor. The truth is that there is not a single city or town in this state where a worker can pay for all of life’s necessities on less than $15.